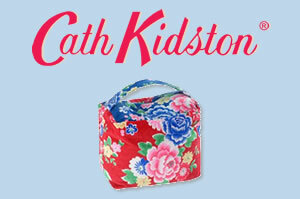 We have been waiting a long time for Cath Kidston to add her own door stop to her range of products but we are delighted to finally introduce the lovely Cath Kidston door stopper made from the vintage inspired Norwich Rose printed fabric with a rich mix of colours and blooms. We spotted the door stop during our visit to the Cath Kidston shop in Harrogate last week and the product has a soft touch due to being made of 100% cotton velvet and it is heavy enough to keep any door propped open. Its dimensions are fairly standard for a typical square door stop with its length about 18cm, the width about 11cm and the depth about 15cm. Next to the door stop was a matching draught excluder, perfect to keep the draughts out this winter. The draught excluder is not only a draught excluder – it can also fold up into a neat little door stop!